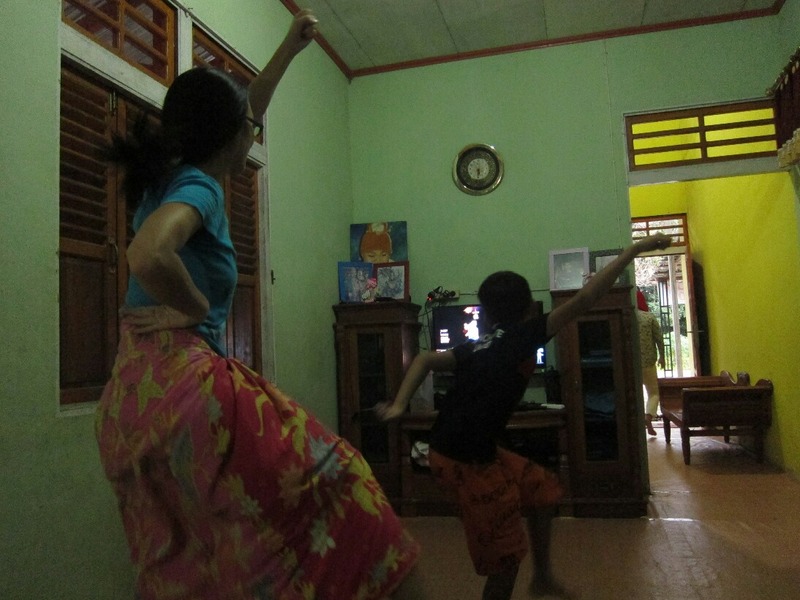 We met Eko, a wonderfully generous and slightly peculiar man, in Pontianak. He was relatively new to traveling and couchsurfing, and was diving into both with every resource at his disposal – typically three cell phones, a portable internet box and countless contacts. 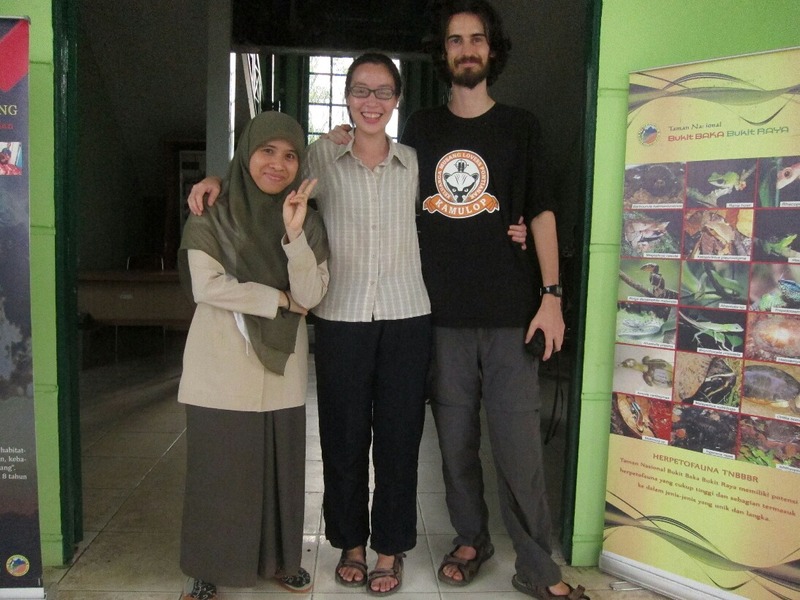 Having recently embarked on a European tour (a rare accomplishment for a Kalimantan local) he was now aiming to travel as much as possible – as a visitor and as a guide. In the last few days he had found an airline selling incredibly cheap tickets to Mecca, and was busy doing rounds of coffee shops and government institutions attempting to recruit faithful Muslims to book their Hajj pilgrimages through him. He owned two sign writing business in Sintang and Pontianak, and also did occasional event management. His goal was to have his businesses running “on autopilot” so he could endlessly travel. The sort of smart security that Caroline and I hadn’t really bothered thinking about when we quit our jobs. “Yeah, he knows everyone. He could be mayor of Sintang if he wanted.” Joked Ardian, our host in Pontianak. And the proof was the constant waving and chatting when we were out walking with him. Always smiling, Eko liked to sing, and at least four times a day he would incorrectly recite the first two lines of Bob Marley’s ‘Three Little Birds’, singing the lyrics: Don’t worry/I’ll be fine. 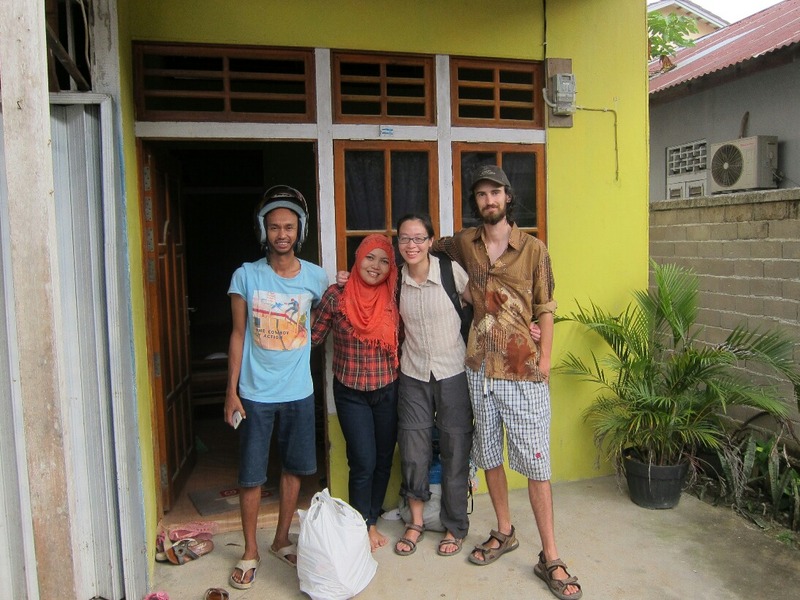 We stayed with Eko, his wife Elita and his two children in Sintang, a charming small town about six hours drive away from Pontianak. It was here that I was given the choice of either being able to ride a motorcycle or not being able to go anywhere. So we borrowed Eko’s friend’s blue automatic Yamaha, the faults of which included no mirrors, a broken speedometer, an unreliable petrol gauge, and an engine that cut out while idling. It was using this bike that we made our way to the Bukit Baka Bukit Raya National Park offices and planned our trip to climb Kalimantan’s highest peak. After a few days of planning we were ready for our epic trek. Ivonne. A worker at the park HQ who we quickly became friends with. She helped us immensely while planning our jungle trek. We were ready to go! but then I got Dengue Fever. We were out buying food and supplies for the trek when I realised something was wrong. My appetite was waning and the sun seemed to be shining too brightly. We rode the bike back to Eko’s house and I slumped into a sleep filled with feverish dreams. Caroline stayed awake half the night dabbing my forehead and chest with a wet towel. The next day we were due to leave, but I felt like I couldn’t do anything and stayed on the couch most of the day. That night things got worse and Caroline asked the family if I could be taken to the hospital to be checked out. Elita was a nurse – a fortuitous coincidence – and Eko used to work at the hospital in the radiology department. Between them they knew most of the staff at the Ada Muhammad Djoen Government Hospital, a facility that contained an unusually large amount of stray cats. I was led past the armies of cats to have my blood tested at a cost of 80 cents. Positive for Dengue. What a wonderful surprise. The next few days for me were (and still are) a blur. I was taken home to be treated by Elita and had an I.V. drip put in my arm. Whenever I needed to use the toilet, which was often, I would have to hold the bag over my head and slowly inch my way down the steep, wooden staircase. 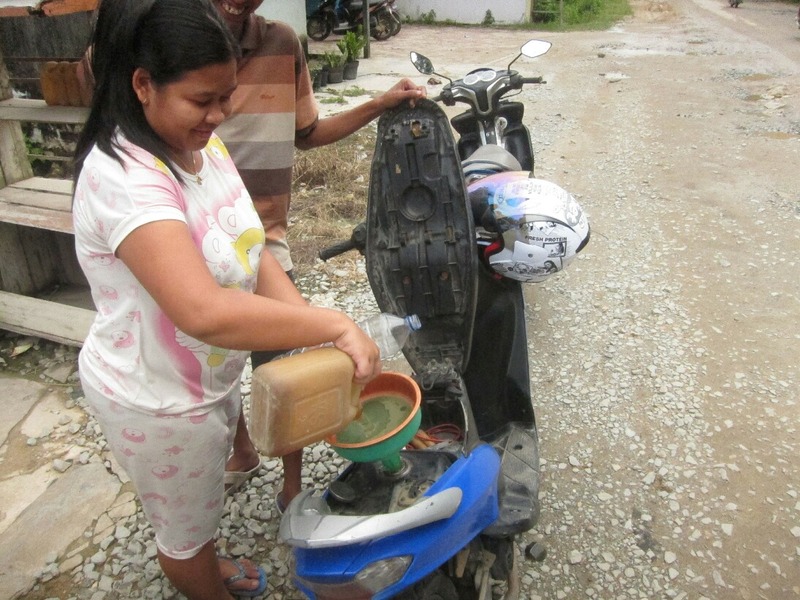 The squatting toilet, like all the toilets we used in Kalimantan, flushed with a bucket-and-rainwater method. This made for a difficult time because I had an IV sticking in one arm, the bag held high with my other arm, and the flush bucket somewhere in the middle. Aside from the awkward toilet times I had no energy and I couldn’t look at food without wanting to vomit. Eko called me a vampire because I couldn’t be in the sunlight without shying away, and I developed a rather fashionable rash of red splotches. I also had a lot of pain behind my eyes and aching joints in my arms and legs. Every day my blood was tested. Sometimes it was extracted in the morning by Eko’s wife and then driven to the hospital for analysis (usually via a coffee shop and a round of airline ticket selling attempts, as Caroline can attest to), and sometimes I was bundled on the back of a motorcycle with the IV bouncing in my bag. Caroline was amazing through the whole affair and stuck by my side, encouraging me to eat (although I couldn’t) and sacrificing a week of her Indonesian holiday to sit indoors with me. Choice bro! Hook me up! For those who don’t know (you probably aren’t in South East Asia) Dengue is transmitted by one type of mosquito – an evil little black and white fiend called an Aedes. If an Aedes mosquito bites someone who has dengue it becomes infected and can pass it on to other humans by biting them. The incubation period is 1-2 weeks in the body, after which time the symptoms I’ve described above (and others) can hit you. Your blood platelet count drops to a dangerously low-level and you need a lot of hydration in order to survive. It can can kill without proper treatment, and it certainly flattened me for a week. Eventually, of course, I recovered, and we took our jungle trek. 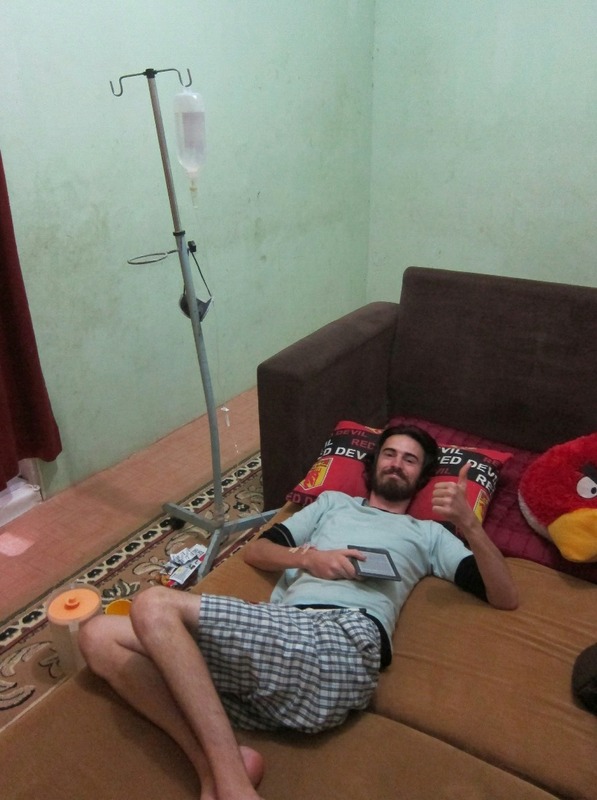 That incredible trip is detailed here, but this post is mostly about getting Dengue. And Caroline, not wanting to be left out, caught it too. Sadly it hit her at a rather inconvenient time – four days into our mountain walk. When we returned to civilization Caroline was two days into the fever. She wasn’t eating and mostly wanted to sleep, but didn’t want to get checked at the hospital because she assumed it was just a bad cold due to walking for hours in the rain. A lot of the symptoms that had hit me hadn’t hit her, so we decided not to err on the side of caution. Poor Caroline had it much worse than me. At least I had a house to stay in, regular care and rest. Caroline had to travel for one day by speedboat in the hot sun, spend two days in Sintang packing and debriefing from the trek, take an eight-hour night bus to Pontianak and crash on Ardian’s floor for two nights, take an 11-hour bus ride overnight through the Malaysian-Indonesian border, and finally check in to the Kuching General Hospital – all this with myriad other ailments from our jungle trek. By the time she actually got into the hospital her fever was gone and her appetite was returning, although her blood platelet count was dangerously low. “In the critical phase,” they called it. Every now and again a nurse would scuttle along and ask for Caroline’s phone number, then scuttle off somewhere to lose it. At one point a nurse asked me to go down to the ‘hospital shop’ and buy a measuring cup to measure urine being passed. I checked every shop in the hospital and discovered that nobody had a measuring cup, and at this point I started to wonder what sort of hospital would require patients to purchase sample vessels externally. In any case, after I came back to the bed empty-handed the requirement for measuring urine seemed to have vanished and the cup was temporarily forgotten. Only late that night did a couple of nurses stroll along and give Caroline an IV drip bottle cut in half, and a log book. Caroline was situated in a ward of five people usually meant for four, in bed ‘9 EXT’ – a bed that had been crammed in between 9 and 10, rendering the privacy curtains useless for all three patients. I lounged on her bed during the day and slept on my air mattress at night, making my bed ‘9 EXT 1/2’. On our left was another girl with dengue. Her and her mother constantly watched us with what I interpreted as contempt, and moved the single visitors chair (meant for me) away from their bed. During visiting hours they engaged in enthusiastic prayer sessions with a local priest. On our right was the guy from the movie ‘The Usual Suspects’, who lies in a hospital bed and ominously croaks, “Keyser Soze, Keyser Soze, Keyser Soze!” Except in our case he was in a coma, and mostly made a sound like mayonnaise being gargled. He was also a woman. Caroline spent her time getting stronger, drinking plenty of liquids, eating full meals and generally feeling good enough to go home. 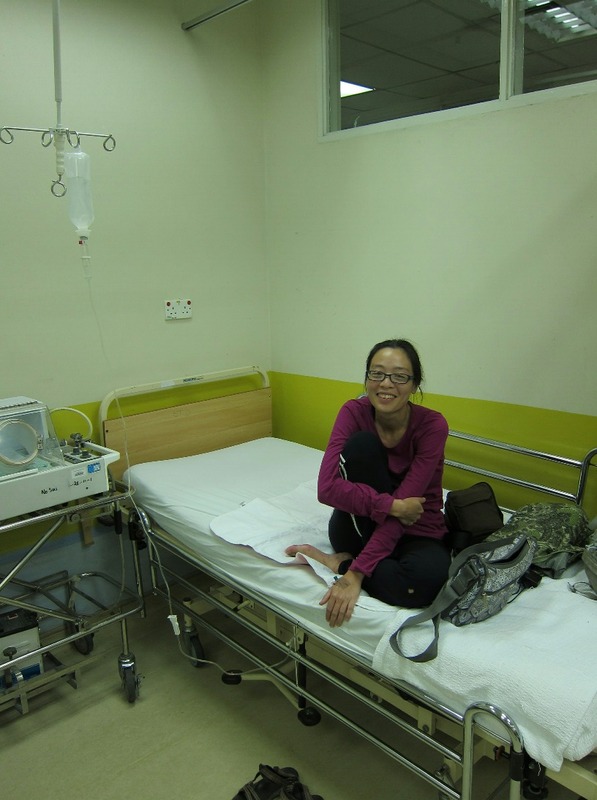 And ultimately, after a very eventful month in Indonesia both of us ended up sitting at a hospital in Malaysia, staring at the wall for hours. And I wrote this. Aiyo, I’m glad the both of you are okay now. It’s scary, but certainly makes for good blogging. Well the preference would have been not to have it… At least it’s not Malaria of Typhoid! We’re actually in Singapore now, in relative luxury.